The Scientists includes a number of historical figures and events that are real, and a lot of the science referenced is true! However, most of these facts have been stretched, contorted, and flipped around for your enjoyment. We've created a short FAQ to clear up any confusion. Is The Scientists a true story? So everything is made up? We didn't say that. The Scientists is historical fiction (emphasis on fiction). Most of the characters are significant scientific figures and there was a World's Fair in Paris in 1889. We have, however, taken significant liberties--often morphing and exaggerating the truth to fit our needs. Give us an example of how you exaggerated the truth. Well, for starters Dr. Hermann Ebbinghaus did in fact study memory by using nonsense syllables. However, he didn't have any lab assistants/best pals named Adolph Weiss and Remy Longrais. He mostly worked alone, using himself as a test subject. We didn't think a play about a man sitting alone repeating "VEY, SEJ, YIK, JOR..." ad nauseum was very engaging, so we gave him some friends! What about the World's Fair? That has to be completely made up. Surprisingly, the facts about the World's Fair in Paris are mostly accurate. Unfortunately, Marie Curie didn't serve as the headliner, but at the 1889 Fair--known as the Exposition Universelle--the Eiffel Tower was debuted, Buffalo Bill and Annie Oakley performed in a "Wild West Show," and there was a real human zoo of over 400 "Indigenous People". No joke. Does Juniper really work as an antidote for bee venom? No. That is completely false. Gin/juniper is not a cure for bee stings. Seek medical attention immediately. Where can I read more on the real scientists mentioned in the play? HERMANN EBBINGHAUS (1850-1909) is the father of experimental psychology of memory and (more importantly) the main inspiration behind The Scientists. He is most famous for discovering the "Forgetting Curve"--the idea that you forget things over time--which he definitively proved by sitting alone for six years repeating 2,300 nonsense syllables over and over and over again. His first work, "On Memory" caused quite a stir in European labs and well-to-do parlors alike and is considered one of the cornerstones of modern Psychology. As the dedication of his book reads "[We] owe everything to you." FUN FACT: In addition to having an impeccable taste in beards, he also discovered an optical illusion: the Ebbinghaus Illusion! MARIE CURIE (1867-1934) is a world renowned chemist, physicist, and saucy minx. Originally from Poland, she moved to Paris to continue her education and marry her lab partner, Pierre. She is most well known for her work with radium and radioactivity, and is the only person ever to win Nobel Prizes in multiple sciences--though she almost didn't receive her second prize when she was discovered having an affair with a married man! FUN FACT: To this day, her research notes are so radioactive, they have to be kept in quarantine. 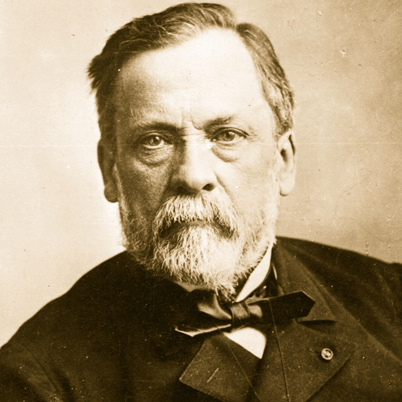 LOUIS PASTEUR (1822-1895) is by all accounts one of the most influential scientists of all time. He is considered the father of bacteriology, immunology, and vaccination, and the method for preventing bacterial contamination in milk bearing his name--Pasteurization--instantly became an essential part of food safety world wide. It is without question or hyperbole that he has personally saved millions of lives with his research. FUN FACT: He is also a fraud and a crook. Not only did he perform trials of untested medications on children without a medical license, but one of his biggest claims to fame--the first vaccine for anthrax--was actually stolen from a veterinarian friend-turned-enemy named Max Perutz. He just took the credit.